It’s survival of the fittest when it comes to evolution, and even casino games haven’t escaped the wrath of natural selection. Many of the most popular and favoured games we see today didn’t just appear out of thin air, and they definitely weren’t created in the format we see today. Therefore, we take a look at the history of some of the very best casino games to see how they have evolved over time. Roulette was actually invented with the main aim of creating a perpetual motion machine in 1965. The man behind it, Blaise Pascal, wanted to defy the laws of physics and create a machine which continuously operated without the need of an external source. Enter natural selection. While the machine failed in terms of Pascal’s hypothesis, it evolved into a gambling game, though it didn’t initially have that single zero we’ve come accustomed to. It wasn’t until 1842 when two French brothers by the names of Lois and Francois Blanc adapted the original roulette wheel to include a single zero. By adding that single zero, the house advantage increased meaning it was favoured by the operators more so than its original version. Perhaps this is where the French roulette rules, including La Partage, were added, in order to make up for the addition of the single zero. Though these rules weren’t adopted by other country’s variants, but we do still see them today in the French Roulette variants. Americans put their own spin on things and added the double zero to the wheel. While this title is still around today, it’s quite unfavourable to the player and avoided by experienced roulette players. European Roulette looks similar to French roulette, but it doesn’t include the La Partage rule. It spread through Europe in the 19th century and is still played today at web casinos and land-based gaming establishments. Roulette has evolved from an attempted science experiment to one of the most popular casino games today. Dating back to the 15th century, we can state confidently the game of baccarat has definitely evolved. It took 500 years for the game to get popular since first being documented, however this game was called Chemin de fer, which is a variation of baccarat made popular in Europe. This variant saw players bet against each other instead of playing against the house. In England, however, Punto Banco was more popular, which is another variant of baccarat that is similar but sees the banker represented by the house. Many variants of baccarat spread around the world, but through natural selection only three versions have become and remained favoured by players. These include Punto Banco, Chemin De Fer and Baccarat Banque (basically a variation of Chemin de fer with the bankers position being more permanent). The popularity of Chemin de fer could perhaps be put down to the references in pop culture, including the game being favoured by James Bond. While at the majority of land-based casinos baccarat is favoured by high rollers, mini-baccarat has also become popular as US casinos adapted the rules to feature lower minimum bets. Online, mini-baccarat has also become one of the most favoured variants available. Baccarat has evolved mainly in terms of rules and variations and continues to be a popular game both online and offline. Poker is perhaps the biggest culprit of natural selection, as it seems to have evolved not only in terms of rules but in terms of what we play the game with. It is said poker came from the basic concept of ranking dominoes and bluffing opponents in association to the combination they had. With this, a variety of myths and beliefs have surrounded the invention of poker including that it was developed in China due to the Emperor Mu-tsung playing domino cards around 970 A.D.
Others believe the Egyptians were responsible for the origin of poker and played with wooden-type cards in the 12th and 13th centuries. However, documented games called Poque and Pochen were popular in the 17th and 18th centuries in France and Germany, respectively. These were said to have been developed from Primero, a Spanish game said to be the mother of poker, which involved each player receiving three cards and bluffing their way to a win. Poque became the national card game in France and spread to the US, though it was referred to as ‘The Cheating Game’ as written by Jonathan H. Green in a book titled ‘An Exposure of the Arts and Miseries of Gambling’. From here, it was said the game of poker was established. Since then three variants of poker have become the most popular titles today, and that includes Texas Hold’em, 5 Card Draw and even 7 Card Stud. Omaha and Razz are also incredibly popular variants, but Texas Hold’em is definitely the fittest of them all. Keno has said to have been born in China during the Han Dynasty and evolved over time from there. Though this is considered to be a legend with ruler Cheung Leung apparently creating the game so he could charge his city’s people to raise funds and finish the war. Another legend says this game was then used again to help raise funds for the Great Wall of China. Regardless, it wasn’t until the 1800’s that the game of Keno was actually documented, but we do know that it did originate in China. However, the game was quite different in that it used 120 Chinese characters. Over time the Chinese characters were changed to numbers, as a result of Chinese sailors bringing the game to the US in the 1800s and the 120 number dropped to 80. 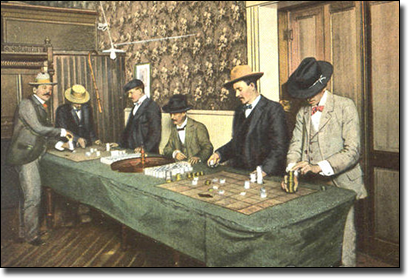 While gambling was considered a legal activity in many places around the world in the 1900s, in some places, such as the US, lotteries were not. Therefore, since the game was so popular but actually illegal many disguised the game as a racing game and titled it Racehorse Keno. Here they would attach 80 numbers to different horses and every time the numbers were drawn it would be called a race. Of course once lotteries became legal it returned to its rightful name of Keno. 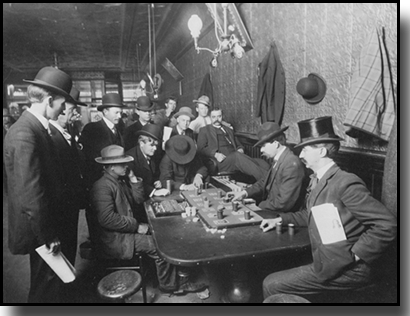 From here the game evolved from a live dealer lottery to an electronic game which was rolled out to pubs and clubs. Requiring a form to be filled out via a pencil, players then take this up to the bar tender or keno operator and have their numbers scanned to receive a printed form. With the introduction of the Internet in the 1990s, however, the game evolved again and the need for forms was redundant. Since both the Internet, and pubs and RSLs, offer the electronic game it is easier and more convenient to just play online. However, NT Keno is the largest game in the nation and actually sticks to its roots by using a live dealer, rather than an RNG operated game. Keno has evolved from a Chinese game to a title recognised globally and is quite popular online and at land-based venues. Slots have a clear timeline unlike the aforementioned titles. 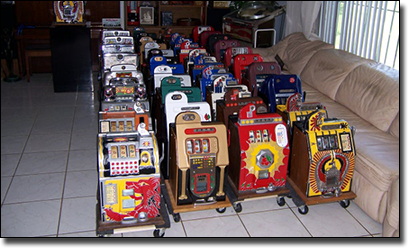 The first poker machine was invented by a pair from Brooklyn called Pitt and Sittman. However this invention was actually a predecessor to the 5-reel pokies we see today, but due to natural selection it was overlooked and the 3-reel slot designed by San Francisco mechanic Charles Fey proved to be more popular at the time. This slot machine contained metal hoops which were aptly titled reels. These spun when a lever that was connected was pulled. Over time this machine was modified, including changes to the symbols, with fruit images lining the reels instead of the original Liberty Bell, earning the 3-reel slots the name ‘Fruit Machines’. Then came the first video slot, designed by Walt Freely, which saw a coin hopper and computer projected onto a TV screen. While these were highly unpopular at first, due to the fact you could no longer see the reels, they survived, all thanks to video poker which was created around the same time and given the rave reviews surrounding them video slots flourished. From the making of the video slot, came the addition of 5-reels, and while there are still 3-reel slots available they could be classified as endangered. Additionally, we now see an array of 3D slots being the next generation of pokies.